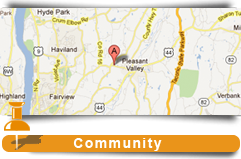 Enjoy country-apartment living at Country Commons, located in the heart of the Historic Hudson Valley. Country Commons is conveniently located in scenic Dutchess County, New York, close to shopping, dining, famous points of interest and the Arlington Central School District. This affordably priced, apartment community offers one and two bedroom apartments that are close to everything that makes Dutchess County a destination of choice. Country Commons is situated in a country setting yet is only minutes from the Taconic State Parkway, and just 90 minutes from New York City. The Hudson Valley is known for its lovely mountain views and historical significance, it is also a great place to enjoy activities such as walking and bike trails, shopping, touring the many quaint towns and much more. For those who love learning, enjoy art, etc. Dutchess County is a great community, offering a wide range of quality academic / vocational institutions. Some of our local colleges are: Marist College, Vassar College, Culinary Institute of America and more. Country Commons is nestled in a quiet neighborhood yet close to all that Dutchess County has to offer. Experience spacious rooms, landscaped lawns, and professionally managed property for a great apartment living experience.